After our train derailed, we caught a bus to Dar Es Salaam. It departed Lusaka at 2pm Saturday and arrived in Dar at 10am Monday. 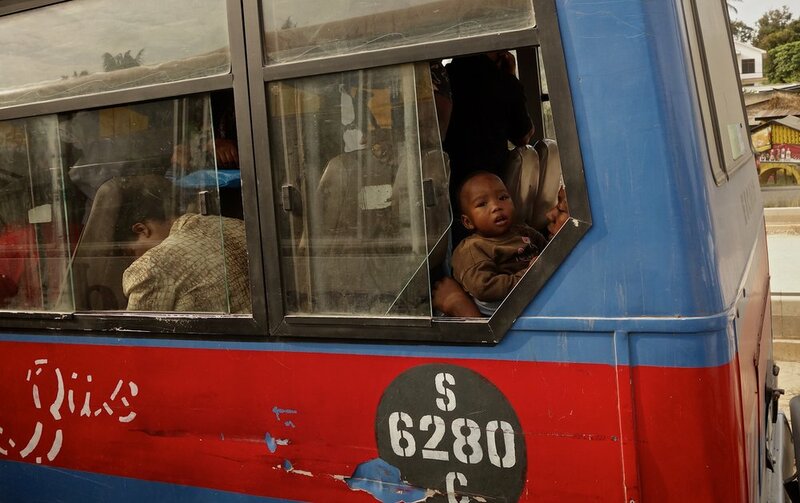 44 hours on a crowded bus with one 4am stop at the border and another to switch buses. The brakes on ours were broken. The tires were totally bald, too, but, fortunately, I didn't notice that until after we arrived. The rickety bus was packed with people, bags and boxes. The man who sat next to me thwacked my face with his towel every time he prayed. He explained to us the reason for all of the numerous stops - looking for more passengers, petrol, no idea - and gave Willa an apple. Another man had such bad foot funk, I choked and teared. He offered Willa a packet of biscuits. We went through the 4.5 liters of water we'd brought and kept hoping each stop would provide more, but the only options were Fanta, Mirinda & Coke. Welcome to the world of soda, Willa. We sat in the back, figuring we had a better chance of survival there. Collisions are frequent and mostly head-on from passing. Our last hour was spent inching in traffic into Dar and swatting at mosquitoes. Our fellow passengers tsk-ed when they learned we were getting off at the city station with no one to pick us up. It is very dangerous. Watch your bags. There are thieves everywhere. We'd heard of 2 women whose bags got snatched by people driving by. The women were dragged and one, a Korean woman, had died. When we finally disembarked, all of the passengers vanished within minutes. We struggled with our heavy backpacks and I zipped my purse inside my jacket. I stood with my fists clenched and legs solid, terrified and willing someone to make a move. No one did. Still, a remaining passenger, the man whose seat had banged against my knees for the past 2 days, the man who had taken countless selfies (his new fb profile photo has Willa's blurred face and half of Johnny's in the background), was reluctant to leave us until he showed us where to get a taxi and we assured him repeatedly that we'd be fine. Not 24 hours later, we are on a ferry to Zanzibar. We need a respite from crowds and pollution. We're splurging and staying at a B&B for a couple of nights. We'll swim in the turquoise water, walk through the Stone Town, go to the market, and I'll drink a beer or 3 and finish Slaughterhouse Five. I know. I can't believe I haven't read it, either."